Does Mr. Beer Really Work? Delicious beer made from the comfort of home is the promise of Mr. Beer, so let’s see how this brewing system performs. Home brewing is nothing new, there have been those that micro brew their own beer at home for several years now, and it’s referred to as hobby brewing. Some avid brewers really know their stuff and can make great tasting beer using their own equipment, but for the novice there’s not really a good way to start. That’s what Mr. Beer is trying to fix. The beer industry is controlled by a few major players, and they’re responsible for 90% of the beer that gets consumed annually by Americans. Microbreweries are enjoying a lot of success making small to medium sized batches of premium quality beer for people to consume on location, or to take home in growlers. A third option is to cut out all of the middle men and brew your own concoctions at home. This can involve a lot of trial and error, a lot of different ingredients and equipment, and additional expense and time. Mr. Beer says they can fix all of that, creating self-contained kits that have everything you need to go from no beer to beer. They claim to be the world’s best selling home brewing system, which is not to big of a claim to verify, because there aren’t many commercially produced home brewing kits to compete with them. The hype comes from the almost unanimous positive reviews that have come in for Mr Beer brewing kits. It’s rare to see a product this well received by the vast majority of those that have tried it out. They don’t really overstate the benefits of their kits, they simply state what you get with them, and what you can produce with them. The cost varies depending on which kit you get, and how much beer you want to make. They have kits that start at $40. The best part is, they’re reusable, so you only need to buy a refill kit to make another 2 gallons of beer. Let’s do the math to see how this stacks up. If you get a start-up kit for $40 you’ll get 2 gallons of beer which is 16 pints or $2.50 a pint. Not bad. Refills start at $16 each so you’re looking a $1 pints. Yum. You should definitely follow the instructions to the letter with any of the kits you try. The taste of your beer and even whether or not it turns into beer, can be greatly effected by omiting a single step, or getting parts of a step wrong during the creation process. Reports are that they’ve made this paint-by-numbers easy so you’ll have a hard time messing it up, but you should still stay focused. Users also say that it’s a lot of fun too, so you shouldn’t worry too much about it. Although it started off with just one kit, Mr. Beer has expanded their line and you can now brew a variety of different styles ranging from Pilsner to Ale, to even hard ciders and root beer. Their recipe list is pretty extensive, and no matter what your palette prefers, from fruity to hoppy to malty, there’s definitely something for you to try. With this wide range of ingredients and recipes, we find it would be hard to get bored with the same old beer again and again, and fun to try different taste combinations. We were a little skeptical about the quality of ingredients, and whether at this price point you’d actually be producing a beer that you would want to drink, but Mr. Beer says they source only the finest ingredients, and we’re inclined to believe them. It’s probably somewhere between the low-grade materials used by the big bottlers, and the highest grade ingredients you’d get at the best microbreweries in the country. Our other concern was how long it takes to brew a batch of beer, and whether the time it takes to brew it and the time it takes to consume it made it a losing proposition. It takes a minimum of 2 weeks to brew a batch, with the recommendation to let it sit and ferment a bit longer. Depending on how quickly you can drink 16 pints of beer, you might have a gap between running out and waiting for the next batch to finish up. But rather than a store bought purchase, this is more like an event, so you end up drinking these with a little more reverence than you would a 6 pack of lite beer you pick up from the supermarket. People have successful given Mr. Beer kits to those they know that love beer, and it really does make a thoughtful gift. There have also been those that state that this produces great-tasting beer from home. It may seem unusual that you could actually produce a drinkable beer, let alone something that you enjoy or even prefer over the mass-produced variety. One user pointed out that buying the refill packs is pretty much the most economical way to enjoy a glass of beer. Another feature to point out is that there’s an avid fan base that is ready to share tips and recipes with you once you get your own kit. This definitely says something about whether or not Mr. Beer works, because there’s no way they could have an open community like this unless they had hundreds of satisfied customers. To be fully honest, being beer lovers we wanted Mr. Beer to be a winner, and luckily it is. It gets nothing but glowing reviews, which is amazing because something as complicated and easy to mess up as brewing beer can be put into a foolproof system that produces tasty results. Of course there will be those few that don’t get it right, but the overwhelming majority are happy with their purchase and enjoy the fruits of their labor. It’s one of those rare products where you really do get to reap the benefits from it. If you’re a beer aficionado, or just pretend to be one, this is definitely worth trying out. It can be fun to make a batch of beer for a special event. My cousin and I made a batch of beer at a local brewery to enjoy during the Super Bowl one year, and it was fantastic. Although we didn’t use a Mr. Beer kit, it was nice having a beer that we brewed ourselves, and everyone really enjoyed it. 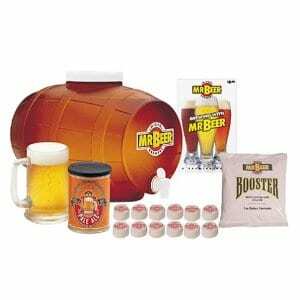 I can’t wait to try my own Mr. Beer kit for his bachelor party that’s coming up. What do you think? Does Mr. Beer work or not? Does the Filtrete Whole House Air Freshener Really Work? Garbage a big mess a lot of work, bottles leek so won’t carbonated , bought 2 full kits black porter, need to wait 4wks & 4wks more for 2 case’s of beer, + a lot of money for garbage !